But a new archaeological survey at in Wiltshire suggests the Neolithic monument had far odder beginnings. In fact, the huge circle started out life as a 100ft square, archaeologists now believe, after discovering a mysterious box-shaped enclosure of giant stones in the middle of the henge. Henge monuments like Stonehenge and Avebury are always round. It is the first time such as square monument has ever been found. Earlier still, at around 3,500BC, experts found a simple rectangular wooden house occupied the site. “We discovered something really weird,”said Dr Mark Gillings, a reader in archaeology at the University of Leicester. “In a landscape of circles, we’ve suddenly got a square and lines. Slap bang in the middle of this monumental structure you’ve got a Neolithic house. The little home at the centre of the Southern Inner Circle may have been built by Avebury’s founding fathers, and over time became such an important symbol of the birth of the community that descendents constructed the monumental square around its foundations, lined with massive stones which enclosed a giant 20ft obelisk. In the centuries that followed, the square was dismantled and the stones were used to construct the three impressive stone circles which still stand today. The team also uncovered evidence that lines of stones once cut across the southern inner circle, like spokes on a wheel. The World Heritage Site, which is cared for by the National Trust, was built over several hundred years in the 3rd millennium BC and contains three stone circles – including the largest stone circle in Europe which is more than 1,000ft across and originally consisted of around 100 standing stones. It forms part of a wider ritual prehistoric landscape in Wiltshire which includes Stonehenge, Silbury Hill and West Kennet Long Barrow. In 1939, marmalade magnate Alexander Keiller discovered a curious line of standing stones next to a fallen down obelisk, but he believed it was the remains of a medieval cart shed and after the outbreak of the Second World War all excavations were put on hold, and the area was never investigated again. However researchers at Leicester and the University of Southampton noticed that many of the finds discovered from the Keiller’s dig were domestic, rather than ritual, such as pottery shards, which suggested the sacred site had once been a settlement. Using a combination of soil resistance survey and Ground-Penetrating Radar the team investigated the same area as Keiller. Dr Joshua Pollard from the University of Southampton said: “Our careful programme of geophysical survey has finally completed the work begun by Keiller. “It has shown the line of stones he identified was one side of a square of megaliths about 30m across and enclosing the Obelisk. “Also visible are short lines of former standing stones radiating from this square and connecting with the Southern Inner Circle. 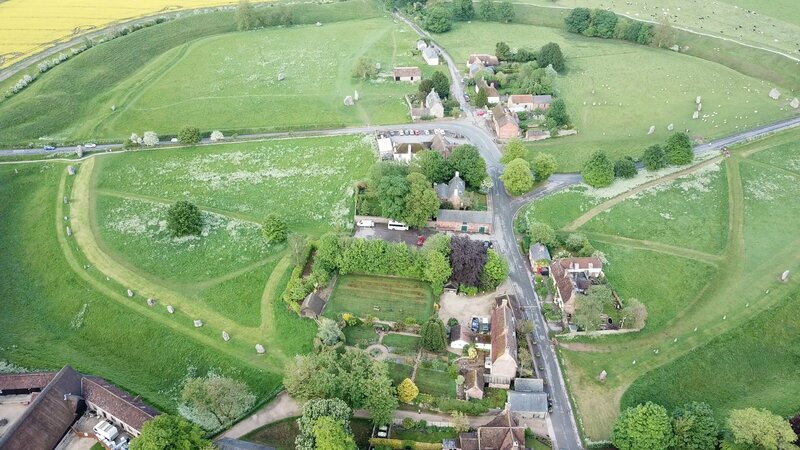 Dr Nick Snashall, National Trust archaeologist at Avebury, added: “This discovery has been almost eighty years in the making but it’s been well worth waiting for.